Elephant walks in traffic in downtown Phnom Penh! Walking out of a riverfront café, I’m confronted by an unusual sight: an elephant standing on the street corner before me. That’s right, a full grown Asian elephant, looking just as though he stepped out of the pages of the Jungle Book. I’ve seen these in more appropriate Southeast Asian locales, but what’s an elephant doing in downtown Phom Penh? The great animal had nobody riding him, and looking him over, I saw no saddle or adornments. The only extras that he wore, were circular wooden plates strapped to his soles. These kept his feet from burning on the hot pavement. Nobody except me seemed to even notice his presence. His only company was his Khmer handler, standing by his side. Dwarfed by the heavy beast, I watched as the handler prodded him with a pole. Following his command, the out of place pachyderm curled up his trunk, stepped off the sidewalk, and headed off into busy downtown traffic. He didn’t even gather a crowd. While motorbikes and cars passed the massive animal, their drivers didn’t even pause to look. The handler and elephant got as much attention, as a boy out walking his dog. This elephant was just another slow moving vehicle in downtown Phnom Penh. Looking to escape the downtown myself, I scan the streets for a ride. Rather than a beast of burden, I choose a more common means of local transport, a tuk-tuk. This half-bred vehicle is a cross between a motorcycle in front, and golf cart in the back. Here these take the place of taxis; a rarity in poverty stricken Cambodia. The driver hops in front, the undersized engine sputters, and we’re off into the downtown maze. Like everything else in Phnom Penh, city traffic has gone through several revolutions. On my first visit here a few years ago, noisy motorbikes ruled the streets. Back then downtown boulevards at rush hour were so thick with buzzing little motos, that crossing the street was a frightening experience. But automobiles have slowly come back, and are more common these days. Predictably, larger vehicles mean worse traffic. Toyotas are taking over the roads, along with the odd Mercedes driven by the elite. Taking me to the northern side of Phnom Penh, my tuk-tuk driver weaves through afternoon traffic, on a road curving around the city’s highest hill. It’s this hill that gave the city it’s name centuries ago. 'Phnom' translates as ‘hill’, and local legend says that a Madame 'Penh' once found four Buddhist statues over by the Mekong River, and placed them up on this overlook. There’s been a Buddhist temple (called a 'wat') up there ever since. Turning away from Wat Phnom onto Street 92, I’m on my way to another icon from the city’s past. Arriving out front, I approach the archways of a hotel. As I walk through the entrance, I feel like I’ve just stepped back in time. The doorman greets me, wearing the traditional costume of a Khmer royal servant. Wearing a smart white coat, his ensemble is topped by a golden hat with a pointed spire at the peak. A musical trio entertains in the lobby; the flute, clarinet and cello play soft music from a bygone era. A European gentleman with a bushy moustache and silver handled cane, reads documents at a nearby table. The décor and architecture are all French. Much like in Laos and Vietnam, the influence of the former colonial masters is evident. It was as though I've just walked into a movie from Cambodia’s French colonial period, while the trio plays the movie soundtrack. At $300 a night, you too can have the colonial experience. 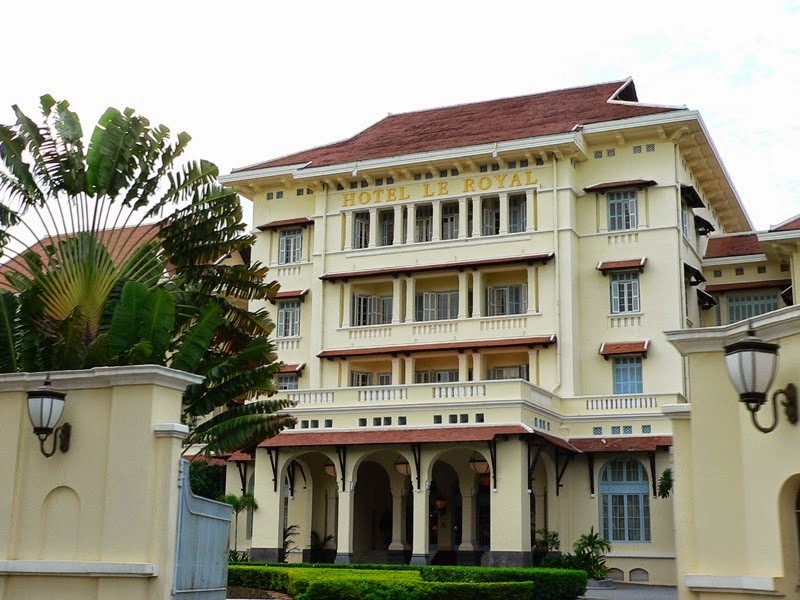 The Hotel Le Royal first opened in 1929, and is Phnom Penh’s oldest surviving hotel. It was also it’s much prestigious. This is where the rich, famous and powerful stayed in the capital. Silent film star Charlie Chaplin stayed here, along with the famed writer W. Somerset Maugham. Seeking more history, I enter the Elephant Bar – perhaps named for the elephant figures woven into the carpeting. Taking a seat at the bar, I glance around. The Elephant Bar is not especially grand, but hotel bars never are. I’m searching for the aura of notalgia, but there’s not much colonial feel in here anymore, except for the wicker chairs. I order a draught beer, from the same bar that once made Jackie Kennedy a champagne cocktail. The famous former First Lady stayed here in 1967, when she was on her way to Angor Wat. 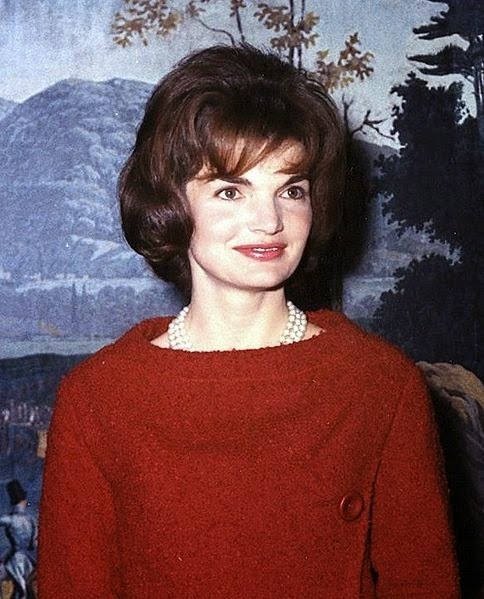 Word is that they kept the champagne glass that she had drank from here for years; complete with her red lipstick marks. As the years passed and the war in Vietnam spilled across the border into Cambodia, this bar became the place to be for expats looking for inside information. Diplomats, journalists, spies and the usual suspects used to meet here during the early 70’s, reporting on the ebbs and flows of the conflict. Information exchanged here led to headlines around the world. Pulitzer Prize winner Sidney Shanberg spent time here, and his experiences with his local fixer Dith Pran later become a book and movie. “The Killing Fields” brought the world’s attention to the genocide wrought upon the Cambodian people. Shanberg’s buddy John Swain wrote his book, “River of Time”, about the last days of this hotel before the city fell to the Khmer Rouge. As time grew short and rebels encircled the city, rooms on the top floor were available for only $5 a night. The cheap rate was only available because the Khmer Rouge were rocketing and shelling the city, so nobody wanted to sleep under a rooftop. Anyone sleeping on the top floor was the most likely to get killed during those final turbulent days. Back when the rebels took the capital in 1975, Le Royale was shut down., and Khmer Rouge troops moved in. What had once been the most glorious lodging in the land, had become the barracks for Khmer Rouge Battalion 310. Eventual peace and the return of foreigners saw the hotel reopened years later. After several name changes, renovations in 1997 sought to restore Le Royale to its former colonial glory. It’s now owned by the same company that owns the famed 'Raffles Hotel' in Singapore. I finish my beer at the bar, and head back out into Phnom Penh traffic. There's still much to see in this intriguing city.